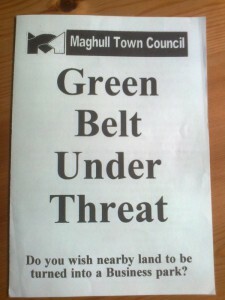 Green Belt – Proposals to build on it from Sefton Council could see Maghull’s population rise by 20%! Shocked Lib Dem councillors, who have consistently fought to preserve the Green Belt around the East Parishes communities, of Sefton Borough are horrified at proposals, from Labour led Sefton Council, that could see a massive development of houses and a business park on high grade agricultural land. The leaflet that the then Lib Dem run Maghull Town Council delivered to all households in the Town in 1998. That battle for the Green Belt was won. After years of talking, Sefton Council has finally said where it thinks houses and employment sites should be built within the Borough. The sites include a huge swathe of land bounded by Poverty Lane, the M58, the Liverpool-Ormskirk Railway line and School Lane. This massive site was last fought over in 1988 when Maghull Town Council, then Lib Dem run, successfully led the campaign for it not to be developed. Sefton say that over 1,600 houses could be accommodated on this site alone. Land bounded by School Lane, Railway Line and Park Lane (presently the site where a Prison had been planned). This site would have 357 residential properties built on it. Land off Wango Lane, next to Valley Close. This site would have 57 residential properties built on it. Land bounded by Waddicar Lane and Rainbow Park. This site would see 141 residential properties built on it. Land bounded by Waddicar Lane and Leeds/ Liverpool Canal, behind Chapel Lane, and Woodland Road. This site would have 144 residential properties built on it. Across the whole of East Sefton it is estimated that there would be 393 residential properties built on various bits of land, like the Damfield Lane development. These sites would only be used if some of the areas already listed in “Option 2” could not be developed for some reason. However, this does not prevent developers putting in Planning Applications with the hope that, even if Sefton refused permission, Planning Inspectors may grant permission. Land bounded by Lambshear Lane, Sandy Lane, Moss Lane and Liverpool Road. This site would have 819 residential properties built on it. It was indicated that the developer who is interested in this site is very keen, and may submit a planning application no matter what Sefton agrees in its policy. 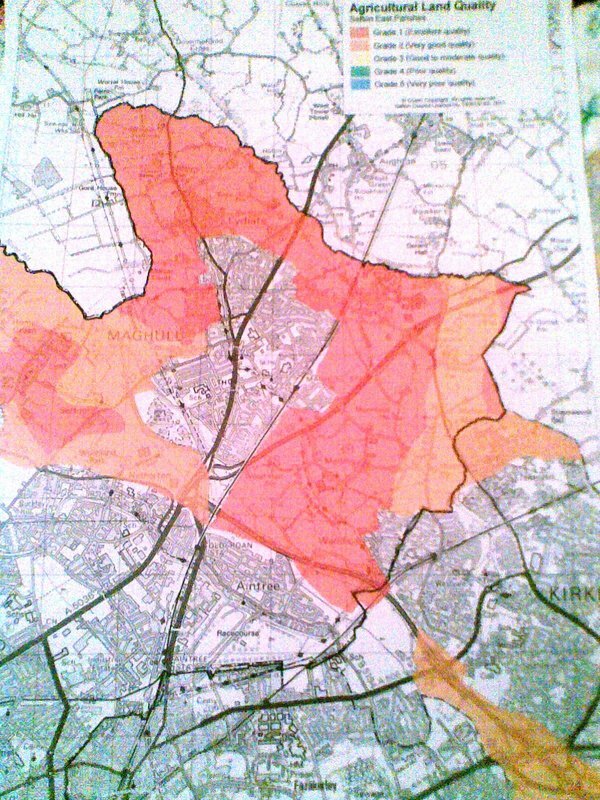 Land bounded by Kenyons Lane, Liverpool Road and Northway (locally known as Tyson’s Triangle). This site would have 257 residential properties built on it. Land bounded by Leeds/Liverpool Canal, Willow Hey, Melling Lane and M58 Motorway. This site would have 89 residential properties built on it. These proposals will go to various Sefton Council meetings and then they will go out to public consultation from mid July through to August. 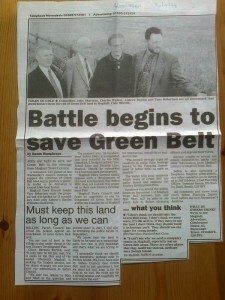 In 1988, as Leader of Maghull Town Council, I led the campaign to stop Green Belt development in and around the Town and readers of this blog will recall that I have recently challenged the Interim Labour Leader of Maghull Town Council to say what she will now do having abstained during the last big Green Belt battle. 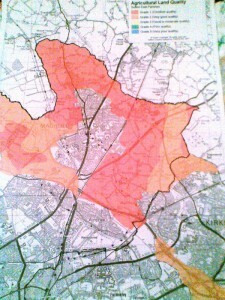 This is an official map of agricultural land qualities in Sefton’s East Parishes. It clearly shows (orange and red areas) that virtually all the land that is presently undeveloped is the best and most versatile agricultural land. The bottom line here is that we could end up with 20% more houses in Maghull if these plans go ahead; clearly such a move would change the character of the community and the best and most versatile agricultural land in England would be concreted over. As an environmental campaigner I am utterly horrified. Lib Dem Cllrs. Andrew Blackburn and Robbie Fenton with our March 2011 East Parishes map (delivered to virtually every house in Lydiate, Maghull, Sefton & Lunt Villages, Melling and Aintree Village) which informed those communities which Green Belt sites were being looked at by Sefton Council for development. The only non-controversial site in the list for the East Parishes is the one where the previous Government had said it wanted to build a new prison, on former Ashworth Hospital land. Sefton’s Green Belt – Why does the total of houses to be built always reach 500 or there abouts? Back some years ago the previous Labour Government (you will find Sefton Labour Party totally in denial about this) had a Regional Strategy which imposed a house building target on Sefton of 500 new houses per year. That Regional Strategy was abolished by the Coalition Government but just hold onto that 500 house building target as we move on. For a number of years Sefton Council has been developing what it used to call its Core Strategy (no one knew what that was) and now calls its Local Plan. In effect this is, at least the part of it that most folks are interested in, a land use policy for the Borough and when it is finally adopted in 2015 it will replace the present Unitary Development Plan. Core Strategy, Local Plan, Unitary Development Plan – all the same thing really but with a few changes at the margins. Remember that 500 house to be built per year that I mentioned before? Well, would you be surprised if I told you that after all the work to date, all the studies, all the paid consultants and even some public consultation in 2011 (to be repeated soon) the figure for houses to be built is still just over 500 per year! Years have gone by, we have been hit by the worst recession in living memory, the Borough’s population has fallen (one of the biggest falls in the UK) yet here we are still ‘needing’ to build 500 houses per year. It could make you think that all Sefton’s sums add up to 500 no matter what figures and factors are included in the calculations. No wonder folks are sceptical about what a realistic house building figure for the Borough really is. And when most of the land that is down to be built on is part of the 2% of England that is high grade agricultural land is there any wonder that no one believes the Council’s stats and sums? A group of over 60 people met in Ince Blundell on 9th May due to big concerns in that small rural community that I used to represent some 10 or more years ago when I was first a Molyneux Ward Councillor and Ince Blundell Parish was then in that ward of Sefton. The wind farm will, should it gain planning permission, be on land that is a part of West Lancashire, not Sefton, because of the somewhat odd drawing of local government boundaries in 1974 when Sefton Borough was created. I have already made clear my own views which are that nothing should be constructed on the high grade (best and most versatile to give it is recognised title) agricultural land that is what the proposed site is made up of. I hear that there are suggestions of concerned people engaging professional legal/planning advice as they take forward their concerns and objections about this wind farm plan. 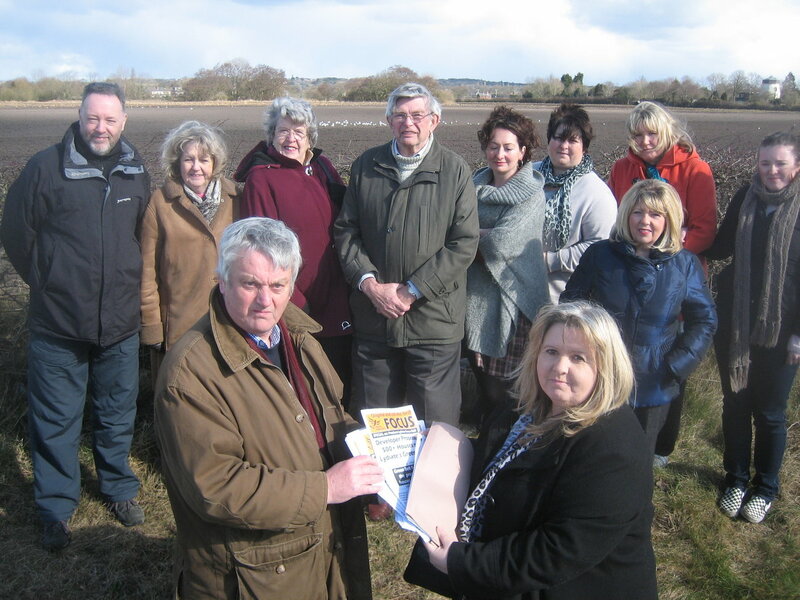 The petition against the proposed development that a mentioned in a previous posting is available to sign in Edie Pope’s Church View Farm Shop on Southport Road, Lydiate. Its 5 months since I wrote that particular posting but what I said is still valid in my view. I went to a presentation last week in Bootle Town Hall about the emerging findings of something called the ‘Consequences Study’ which is being undertaken by planning consultants NLP for Sefton Council. It seems reasonably clear to me from that event that the house building ‘requirement’ for Sefton is being built (sorry for the pun) upon a significantly rising population created in no small part by predicted inward immigration into the Borough from elsewhere. That ‘from elsewhere’ is what ONS (Office of National Statistics) are trying to predict, although not in my view with any great certainty. There was a chap at the presentation from Thornton Parish Council and he asked about such ONS projections and their validity. His point, I think, was that ONS will have taken immigration into the UK together with UK residents moving around and extrapolated an answer for each local authority area but that can’t be much more than sticking a finger up in the wind as how on earth can anyone know how many immigrants will want to settle in Sefton as opposed to anywhere else? The bottom line for me is that despite all the work and studies the house building ‘requirement’ for Sefton is little more than informed guesswork. But, when the best and most versatile agricultural land in England is at stake, if it gets built upon, it seems environmentally daft to me to put it at risk based on highly questionable/unpredictable population stats. My guts tell me that preserving that mere 2% of England’s land mass that is such high grade agricultural land and which makes up the vast majority of Sefton’s Green Belt has to be the priority for feeding future generations. Despite my strong attachment to environmental sustainability I am trying to keep an open mind about Sefton’s Local Plan as it begins to emerge, but it is hard going. My thanks to the local resident from Lydiate for raising this with me again. 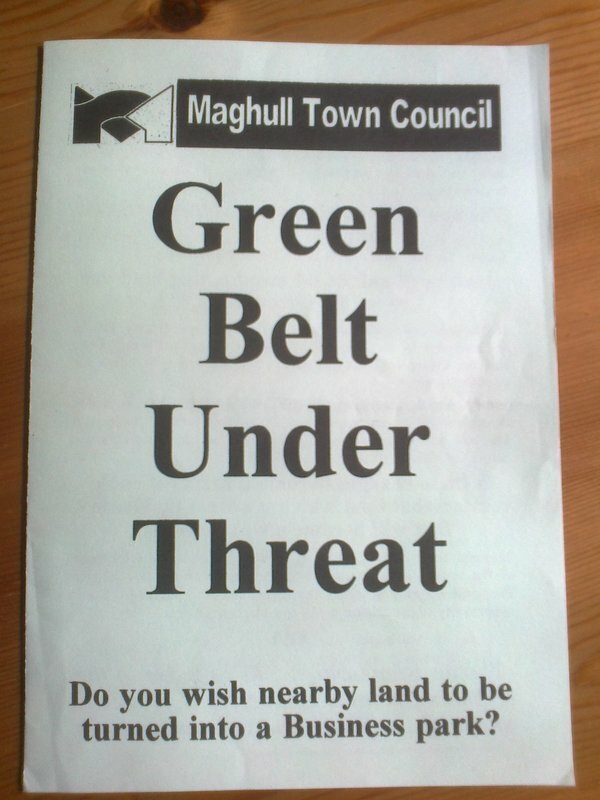 Save our Green Belt – What will Maghull Council do under its new Leader? Maghull Town Council has a new (Interim) Labour Leader in the form of Sandra Williams; she is the third Leader of the Council in less than 2 years. But why do I mention this revolving door of Labour Leaders? History teaches us many things and this time it comes from an edition of a former newspaper that used to cover the Maghull area called the Maghull and Aintree Advertiser, which was a part of the Ormskirk Advertiser Group. Its edition of 30th July 1998, which is reproduced above, was all about how the Town Council under its then Lib Dem rulers was fighting to save the Green Belt. So back in 1998 Sandra was reluctant to support Green Belt defence as shown by her abstention. But what will she lead the Town Council to do now as she has moved from opposition councillor to Leader of the Council? Will she follow fellow Maghull Town Councillor and Sefton Borough Council Leader Peter Dowd who has recently upset many Green Belt campaigners by openly talking about building on the Green Belt? Or will she back MP for Sefton Central, Bill Esterson, who says he opposes building on Green Belt? During the last round of public consultation over the future of our Green Belt in 2011 Labour led Maghull Town Council stood out like a sore thumb due to its abject failure to make a submission to Sefton Council in defence of our precious Green Belt. 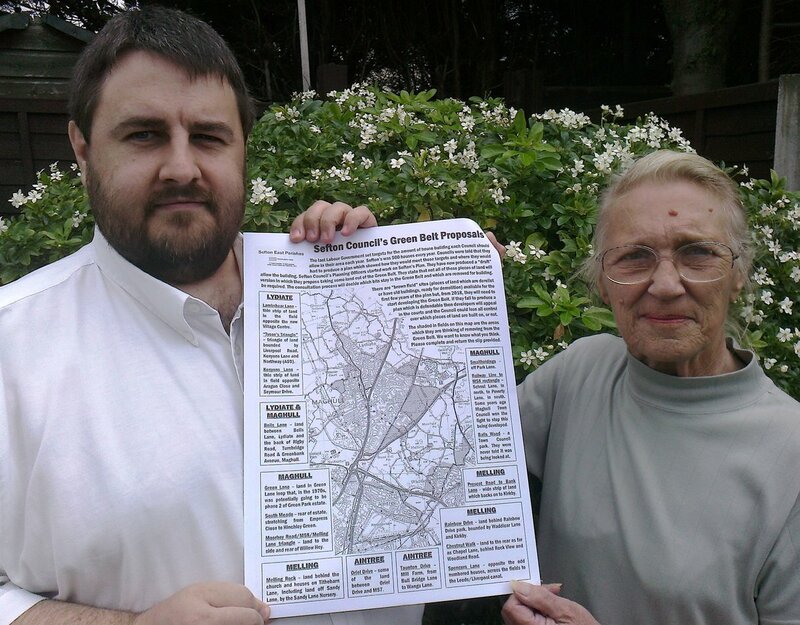 * The other Labour member of Maghull TC back in 1998 was Glenys Jones who sadly passed away some years ago. * Cllr. Andrew Beattie (second from right hand side of photo) sadly died in 1999. * Cllr. John Sharman (left hand side of photo) can still be seen out and about in Maghull and he is heavily involved in Aughton & Maghull Rotary Club. * Former Town Councillor Charles (Uncle Albert) Walker (second from left) is now a young 91 years old and still turns out to the weekly quizzes at Maghull Town Hall on a Wednesday evening. * It seems I had dark hair back in 1998 (ugly one on right hand side of photo)! Well I have heard it all now; Bill Esterson thinks he got the road going again when it was looking like it was not going to happen. Where he gets that idea from beats me. The new road has never been in any serious doubt what so ever since the Coalition Government gave it the green light following Labour, when they were in government, giving it no more than an amber light. Indeed, I remember only too well the Transport Minister coming to Switch Island to confirm the Coalition was giving it the go ahead. Mr Esterson was not at that event. But the real heroes of this campaign are not MP’s or even Borough Councillors, they are the people of Thornton and their Parish Council. It was Thornton folk who resurrected the campaign around the turn of the last Century when they organised a mass protest/march to wake up a then sleeping Sefton Council that thought it could never get the road built. I was on that march and a great day it was too; the start of what was to be a successful last push after years and years of the project going nowhere. So let us celebrate for sure but as for the MP trying to give the impression that the project was in the balance and that he helped to kick start it again! Give me strength…..